What would I do without paper?! Go crazy that's what. Below is the latest piece that I've been working on. A close encounter with the wolf is soon at hand. Sometimes I feel like I'm on my way to meet the wolf when I put my work "out there". It still is a little difficult to show what I do - gulp. You'd think I'd be over that by now. This is one of several pieces that will be available in my shop towards the end of next week. Have a great weekend everyone! This time it's for real. I thought that last night's post was the last for the week. I can't seem to stay away. PS - I posted a new interview on Crafty Synergy this morning. Enjoy! Oh, how I love your trees. That's what kept me coming back to your blog for so long, my love of tree imagery. You still do it so well, but I get to appreciate the other stuff on your blog when you don't work on them. Could be my favorite tree yet! Have a great weekend. Like Jo said, I'd love to see a series of these. So great. Love it. wow! i love the POP of RED..fantastic piece! I'm a new visitor, so this is the first of your work I've seen. It is just great. 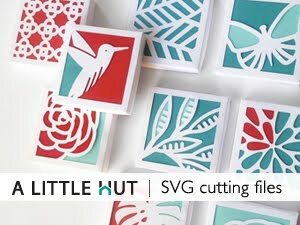 I've loved paper cuts ever since I saw the fantastic Chinese ones, and combined with this modern look and the traditional theme - it is just so great. new visitor, too, and this cutout creation is gorgeous! 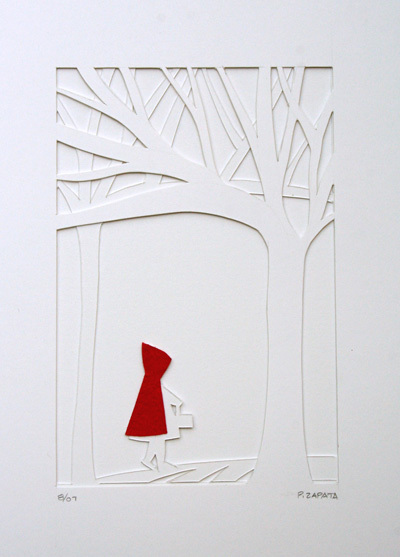 love the trees and the contrast red cape. beautiful.